Home > User galleries > Mustang07 > Misc. 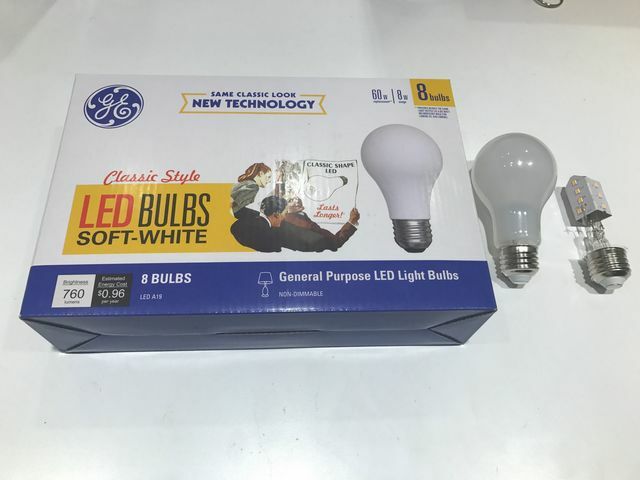 I found these at Lowes, probably one of the best looking LED A shape bulbs I've seen so far. On the far right you can see the internals and how they are constructed. Album name: Mustang07 / Misc. Definitely not the best, since it's not a filament LED but a step in the right direction. I have some Greenlite inside-frost filament LEDs that look insanely like classic inside-frost incandescents! How is the color on these? Do they actually look just like soft white incandescents or are they pinkish like a lot of "soft white" LEDs? I'd say the color is a little drab, kinda like a CFL, but even more so. The "Typical LED Shape" GEs were a little better in that regard, though those seem to be phased out in favor of these. Ah yeah that's what I've noticed with a lot of newer LEDs too. The older ones weren't as bad but they were a whiter color too, like 3500K, which I actually prefer over the 2700K "soft white". I can't use those 5000K daylight LEDs though. I've seen people use them and it makes the house look sterile like a morgue or operating room. I also find it weird these are not dimmable. At this point in the game I would have assumed all LEDs would be dimmable. Most lesser-brand LEDs like Greenlite, MaxLite, and Cree are dimmable. I wonder how much cheaper a non-dimmable LED actually is. I have three Utilitech LEDs from like six years ago and even THAT'S dimmable (though I don't have any dimmer switches in my house so I haven't ever dimmed them). I like the fade-out that the dimmable LEDs have. Much like an incandescent lamp. Last thing would be the inferior lumen output. I'd expect any 60W LED nowadays to be 800-900 lumens. Anything less than 800L is "inferior" to me lol. Well, many 60w "deluxe" types were way less than even 760lm, 760lm is about a double-life type bulb. Reveal, for instance, in 60w was like 620 lumens. True but the brighter the better.